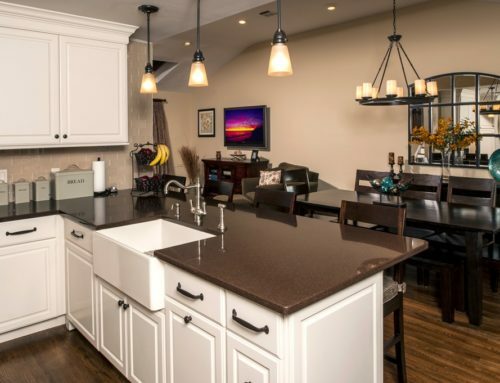 A farmhouse kitchen can provide a great feel to your home. There are many details that can be incorporated within the actual design as well as within the surfaces and the accessories. 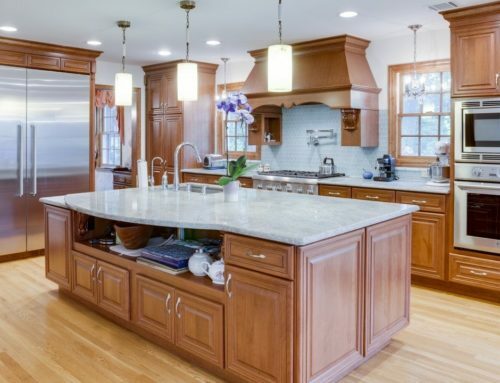 It is a relatively traditional style kitchen and recalls a time where Colonial living was still going on. It can provide the warm feeling you have been trying to achieve instantly. At Designers Choice, we love this theme. Open shelving is one of the most prominent designs within a farmhouse kitchen. As opposed to choosing cabinets with solid doors on them, you will have shelves as well as cabinets that feature windows on them. This will allow you to see all of the plates and dishes you have – and give you easy access to all of them. An old-fashioned range can be added as well. There are plenty of vintage units, complete with stovepipes that will provide a magnificent look within your kitchen. Just because you choose a range with vintage aesthetics doesn’t mean it cannot have the latest technology. Flooring is a critical aspect when creating the design as well. You want to explore classic flooring, which means getting rid of tile, cork, or any modern flooring you have. Wood floors are ideal and you should leave them natural or paint them. Some checkered designs of linoleum can also fit the look, so it is a matter of preference. It’s a good idea to add some vintage accents throughout the kitchen. This can be done with whitewashed wood panels over the drywall, pitchers, and pottery around the shelving, and even some vintage signs placed around for that look of nostalgia. An apron-front sink is something you want to include within the design of a farmhouse kitchen, too. This is a deep bowl with a broad face – and the apron-front will stand up to the heavy duty use of your household. There are various designs and you can find them easily because more people are going back to the farmhouse style. Depending on the size of your kitchen, there are other things that can be added. One major thing is that of a large wooden table. It can be made from reclaimed wood to give it that natural, rural look. A large farmhouse table can take the place of a kitchen island as well as a dining room table – and can easily sit six if not eight or ten people. Another thing you may want to consider adding is some freestanding cabinetry. This can take the form of a pie safe, a hutch, a china cabinet, or something else. Many furniture stores offer wooden designs with bun feet so you can make sure it fits the overall design of your kitchen.